Following on from this recent post about Anglo-Saxon wisdom literature, here are two extracts from the 'Metres of Boethius', a sequence of Old English poems based on the metrical sections of Boethius' Consolation of Philosophy. This is Metre 3.
fremdre worulde. Him is frofre ðearf. in an unwelcoming world. It needs comfort. Here's the section on which this is based; the Old English is briefer and simpler, and somehow more poignant to me for that reason. My translation can't capture how much the sound of the poetry contributes to this picture of a mind growing dark, squelched by sorrow, sinking into a bottomless pit: the sweorcende mod, sorgum geswenced. Say out loud the word gnornunge - couldn't you guess without being told that it means 'grieving, lamenting'? By contrast, here's the OE Metre 22, for which compare this. swa hit wolde, gif hit geweald ahte. þenden gadertang wunað gast on lice. goodre lare, gif hit growan sceal. findan on ferhðe, gif he frugnen bið. mon on mode mæla gehwylce. he had once sought outside himself. serene star of the heavens, shines most brightly. as brightly as it wants to, if it had the power. as long as the spirit and body live entwined together. good teaching, if it is to grow. in his mind, if he is questioned. a man in his mind at all times. Yesterday in Oxford the sun was blazing down, sunnan on sumera at its very brightest, hottest, most all-embracing. Can the mind, sinking in so fearsome and fathomless a mire, really ever learn to be as bright as that? Some life advice from the late fourteenth century. His oune vessel, and soþ hit is. Seche, and þou schalt fynden amis. For vche mon ouȝte him-self to knowe. So schaltou þeiȝ þou hed sworen. Vche mon oute him-self to knowe. Riht as a glentand glem hit geth. What is al þat forþ is past? Hit fareþ as a fuir of heth. For synnes seeknesse þi soule sleþ. Hou ofte sunne þe haþ ibounde. Amende þe, and þi-self knowe. And diȝede for þe wiþ gret distres. Vche cristen mon ouȝte þis to kenne. For vche mon ouȝte him self to knowe. Þei þou haue kyngdam and empyre. So schal souereyn, so schal syre. For eueri mok most in-to myre. Hou sone þat hit is forþ islyde. Vr bost, vr brag is sone ouerbide. Deth haþ leid hem wonderly lowe. Þer schalt þou þe same seone. Amende þe, þou wot what I mene. His own vessel' - and true it is. Seek, and you shall find amiss. For each man ought himself to know. So shall you, though you've sworn you won't. You never know if you will stay till morrow. Unless your sins you confess and show! Each man ought himself to know. But as a blast blows out your breath. Like a glancing gleam it is gone. What is all that forth has passed? It fares like a fire on the heath. For sin's sickness your soul slays. To save your soul if you are slain. Until all your sins have been reckoned up. Stay there a while, and take your time. Make amends, and know yourself. And died for you, in great distress. If he is judged by right justice. The worms will make food of your flesh. Each Christian man ought to know this. And think that you reign here but a short while. Though you have kingdoms and empires. So shall sovereign, so shall sire. All muck goes back into the mire. How quickly it slides away. Our pomp and power all pass by. Death has laid them wondrous low. Ask mercy with a mild spirit. Amend yourself; you know my meaning. Although this poem is perhaps not Middle English verse at its most sophisticated, it has some things to recommend it. There are several neat phrases made memorable by alliteration: we are told that life is like a 'glancing gleam', consisting of 'longing and being in labour' - while 'all muck goes back into the mire' is a particularly strongly-worded version of 'you are dust, and to dust you shall return'! The poem has a distinctive form and subject-matter which it shares with a number of poems in the same two manuscripts - I've posted several examples before, including 'In a church where I did kneel', 'Think on yesterday' and 'In summer before the Ascension'. They're poems of counsel and advice, urging the reader to consider the brevity of life and the ubiquity of human failings, and suggesting possibilities for amendment. The strategy for learning to know yourself here is, of course, overtly Christian, advising you to think about your good and bad deeds, but its approach to life is refreshingly straightforward and generally applicable: be glad if things are good, amend what you have done amiss, and everything will be fine. You might not much like the idea of tallying up sins with 'counters round', but it does offer an optimistic take on the human possibility for improvement and the chances of forgiveness and a fresh start - more perhaps than we allow ourselves today. The poem's suggestion of round 'counters' as a way of gaining self-knowledge reminded me with amusement of this self-assessment tool for researchers, which is designed to show you all the things you're supposed to be and do in order to become a successful academic. Although it's intended to be helpful, and many people doubtless find it so, as a form of self-reflection it utterly defeats me - it just makes me want to cry. I don't necessarily doubt my ability to acquire any or all of the skills listed, but I despair at being able to prove that fact to someone else's satisfaction. Is everything one does in life to be evaluated solely as evidence of skills to be demonstrated to a potential employer (even, absurdly, 'self-reflection' itself)? That Wheel of Inhuman Perfection is of a piece with all the formal education I've ever had - as a child of the 1990s, education was nothing but mark-schemes, and 'don't learn that, it won't be on the exam', and 'make sure you use the exact keywords or you won't get the points'. I went along with all that, dutifully ticked all the boxes - and all I ever really learned (by accident) is that no success will ever be enough to earn you approval or happiness or peace of mind. One of the most insidious effects of my current job situation is that the more I worry about my career, the more difficult it becomes to remember that my career is not my self, and to try and believe there's more to the value of my life than can ever be put on my CV. A career-focused view of life, especially in academia, insists that everything you do must be constantly up for evaluation, by people who don't really value you (or anyone) at all; I've learned, and wish I had realised sooner, how much this daily erodes my own sense of what's important and what I'm allowed to value about myself. It actively works against true self-knowledge by teaching you that you are only worthwhile in as far as you meet someone else's impossible standards. Once it might have been the job of educators to challenge that limited view of human life, to insist on exploring the consequences of the obvious truth that 'this world does but men betray' - to teach that rather than striving for money, success, or power, you might be happier if you try to know yourself and focus on what's really important. But that's not what schools and universities do any more. The goal of all my school's fussy box-ticking was not really to teach us anything, just to prepare us to get a job - but even with the best career in the world, still 'this world's goods away will waste'. Medieval schools might have been pretty tough, but at least they didn't teach children that the value of their life lay in how many exams they could pass. The reason this poem reads a bit like a list of cliches is that the ideas it promotes were ubiquitous in medieval literature, as a glance at just a few examples will demonstrate; medieval 'clerks' brought up on The Consolation of Philosophy and similar texts had such messages inculcated in them from their earliest schooldays. 'Know this worldly honour, how quickly it slides away...' By comparison with their modern equivalent, such doom-laden lessons seem (perhaps paradoxically) tremendously humane, generous, and wise. Sit down with your little counters, 'stay there a while and take your time', and learn to understand the true value of your actions - learn how to be a good person, not just a successful one. It encourages reflection, patience, and compassion towards yourself and others, and the insistent focus on the idea that 'you reign here but a short while' is a reminder to focus on what's important, to consider what really matters in the end - which is not, for most of us, going to be any great achievement or worldly success, but our relationships with others, and the good we manage to do in the little time we have. Primary school children in this country now have lessons in mindfulness, to help them cope with the stress of constant assessment; perhaps we should do the medieval thing, and teach them Boethius instead. 'Whence, what, whither': the best advice you'll ever get. we keep that feast at Midsummer, with much honour. On this Midsummer feast of the Nativity of John the Baptist, here's an extract from Ælfric's homily for the day. It can be read in full here. Ðreora manna gebyrdtide freolsað seo halige gelaðung: ðæs Hælendes, seðe is God and mann, and Iohannes his bydeles, and ðære eadigan Marian his moder. Oðra gecorenra manna, ðe ðurh martyrdom, oððe þurh oðre halige geearnunga, Godes rice geferdon, heora endenextan dæg, seðe hi æfter gefyllednysse ealra earfoðnyssa sigefæste to ðam ecan life acende, we wurðiað him to gebyrdtide; and ðone dæg, ðe hi to ðisum andweardan life acennede wæron, we lætað to gymeleaste, forðan ðe hi comon hider to earfoðnyssum, and costnungum, and mislicum fræcednyssum. Se dæg bið gemyndig Godes ðeowum ðe ða halgan, æfter gewunnenum sige, asende to ecere myrhðe fram eallum gedreccednyssum, and se is heora soðe acennednys; na woplic, swa swa seo ærre, ac blissigendlic to ðam ecum life. He wæs asend toforan Drihtne, swa swa se dægsteorra gæð beforan ðære sunnan, swa swa bydel ætforan deman, swa swa seo Ealde Gecyðnys ætforan ðære Niwan; forðan ðe seo ealde æ wæs swilce sceadu, and seo Niwe Gecyðnys is soðfæstnys ðurh ðæs Hælendes gife. Nis butan getacnunge þæt ðæs bydeles acennednys on ðære tide wæs gefremod ðe se woruldlica dæg wanigende bið, and on Drihtnes gebyrdtide weaxende bið. Þas getacnunge onwreah se ylca Iohannes mid ðisum wordum, "Criste gedafenað þæt he weaxe, and me þæt ic wanigende beo." Iohannes wæs hraðor mannum cuð þurh his mærlican drohtnunga, þonne Crist wære, forðan ðe he ne æteowde his godcundan mihte, ærðam ðe he wæs ðritig geara on ðære menniscnysse. Þa wæs he geðuht ðam folce þæt he witega wære, and Iohannes Crist. Hwæt ða Crist geswutelode hine sylfne ðurh miccle tacna, and his hlisa weox geond ealne middangeard, þæt he soð God wæs, seðe wæs ærðan witega geðuht. Iohannes soðlice wæs wanigende on his hlisan, forðan ðe he wearð oncnawen witega, and bydel ðæs Heofonlican Æðelinges, seðe wæs lytle ær Crist geteald mid ungewissum wenan. Þas wanunge getacnað se wanigenda dæg his gebyrd-tide, and se ðeonda dæg ðæs Hælendes acennednysse gebícnað his ðeondan mihte æfter ðære menniscnysse. 'The holy church celebrates the birth-tide of three people: of the Saviour, who is God and man, and of John his herald, and of the blessed Mary his mother. Of other chosen people, who have gone to God's kingdom through martyrdom or other holy merits, we celebrate as their birth-tide their last day, which, after the fulfilment of all their labours, bore them victorious to eternal life; and the day on which they were born to this present life we let pass unheeded, because they came here to hardships and temptations and various dangers. The day is worthy of memory for God's servants which sends his saints, after victory won, from all afflictions to eternal joy, and that is their true birth - not tearful, as the first, but rejoicing in eternal life. He was sent before the Lord, as the day-star goes before the sun, as the beadle goes before the judge, as the Old Testament before the New; because the old law was like a shadow, and the New Testament is the truth itself, through the grace of the Saviour. very many of the Church’s teachers recount... that our Lord was conceived and suffered on the 8th kalends of April [25 March], at the spring equinox, and that he was born at the winter solstice on the 8th kalends of January [25 December]. And again, that the Lord’s blessed precursor and Baptist was conceived at the autumn equinox on the 8th kalends of October [24 September] and born at the summer solstice on the 8th kalends of July [24 June]. To this they add the explanation that it was fitting that the Creator of eternal light should be conceived and born along with the increase of temporal light, and that the herald of penance, who must decrease, should be engendered and born at a time when the light is diminishing. Bede, The Reckoning of Time, trans. Faith Wallis (Liverpool, 2004), p. 87. They were, as Ælfric says, anes geares cild, 'the children of one year'. After Midsummer se woruldlica dæg wanigende bið, the earthly day is waning, and it goes on waning until the winter solstice brings Earendel and the birth of the sun. 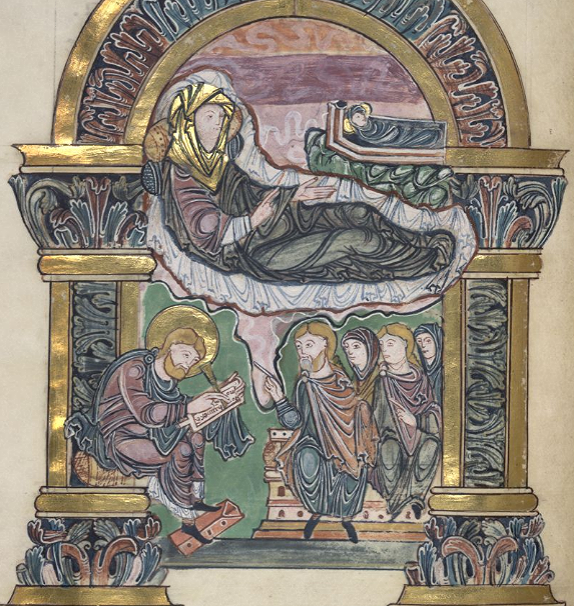 The Benedictional of St Æthelwold, produced a little earlier in the tenth century than Ælfric's sermon, depicts the birth and naming of John the Baptist (BL Additional 49598, f.92v): above, Elizabeth with the baby; below, Zechariah writes 'His name is John'. I've recently begun a new Twitter project, called Old English Wisdom. The idea is to tweet proverbs, maxims, and other miniature bits of wisdom and advice from Old English poetry and prose, anything which falls under a very broad definition of 'wisdom'! Old English literature abounds in such pithy statements, ranging from wry proverbs about mead-drinking and money to practical advice about moderate behaviour, from a warrior's code of conduct to profound reflections on how one acquires wisdom and the benefits it can bring. There's almost a limitless amount to tweet, and it seemed to me it might be an interesting way to combine the popular fascination with the Old English language (which never ceases to take me by surprise) with an opportunity to post about some texts which are not as well-known as they deserve to be. So the Alfredian texts were a natural place to go in search of wisdom; and passages which are too long to tweet are probably going to end up on this blog! Here, for instance, is an extract from the Old English translation of Augustine's Soliloquies, which is one of several extended additions to the source (the text is from here, with my translation). Geðenc nu hweðer awiht mani mann cynges ham sece þær ðær he ðonne on tune byð, oððe hys gemot, oððe hys fird, oððe hweðer ðe ðince þæt hi æalle on anne weig þeder cumen? Ic wene þeah ðæt hi cumen on swiðe manige wegas: sume cumað swiðe feorran and habbað swiðe længe weig and swiðe yfelne and swiðe earfoðferne; sume habbað swiðe langne and swiðe rihtne and swiðe godne; sume habbað swiðne scortne, and þeah wone and nearone and fuulne; sume habbað scordne and smeðne and rihtne, and þeah cumað æalle to anum hlaforde; sume æð, sume uneð, naðer ne hi þeder gelice eaðe cumað, ne hi þer gelice eaðe ne beoð. Sume beoð on maran are and on maran eðnesse þonne sume, sume on læssan, sume ful neah buton, buton þæt an þæt he lufað. Swa hit bið æac be þam wisdome. Ælc þara þe hys wilnað and þe hys geornful byt, he hym mæg cuman to and on hys hyrede wunian and be lybban, þeah hi hym sume near sian, sume fyer; swa-swa ælces cynges hama: beoð sume on bure, sume on healle, sume on odene, sume on carcerne; and lybbað þeah æalle be anes hlafordes are, swa-swa æalle men lybbað under anre sunnan and be hyre leohte geseoð þæt þæt hy geseoð. Sume swiðe scearpe and swiðe swotele lociað; sume unæaðe awiht geseoð; sume beoð stæreblind and nyttiað þeah þare sunnan. Ac swa-swa þeos gesewe sunne ures lichaman æagan onleoht, swa onliht se wisdom ures modes æagan, þæt ys, ure angyt. Consider now, how many men seek the king's court when he is in town, or at his assembly, or with his army; and do you think that they all come there by the same road? I think, in fact, that they come by many different roads. Some come from afar, and have a very long and very bad and very difficult road. Some have a road which is very long and very direct and very good. Some have a very short road, which is nonetheless dark and narrow and dirty. Some have a short and smooth and direct road. Yet they all come to the same lord, some with ease, some without ease. They do not come there with equal ease, nor are they equally at ease when they are there. Some are in great honour and in more comfort than others, some in less, some almost without any, except for the one whom he loves. So too it is with wisdom. Every one who desires it and eagerly asks for it may come to it and dwell in its household and live close to it, but some are nearer to it, some further away. So it is in every king's court: some are in the chamber, some in the hall, some on the threshing-floor, some in the jail-cell; yet they all live there by the favour of one lord, just as all people live under one sun and by its light see all that they see. Some see very sharply and clearly, some can only see anything with great difficulty; some are stark blind, yet still enjoy the sun. And just as the visible sun gives light to the eyes of our body, so wisdom gives light to the eyes of our mind, that is, our understanding. The speaker here is 'Reason', addressing the Augustine persona, who is (perhaps) the Alfred persona too. 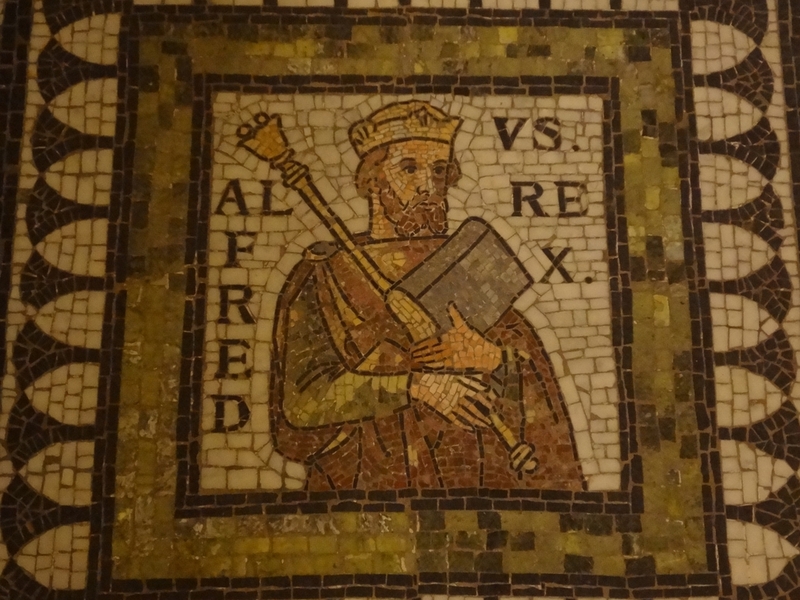 The funny thing about Alfred later being mythologised as such a great sage is that if we can locate his voice anywhere in his translations it would be as the learner, not the teacher - he is no Solomon, but a humble, anxious searcher after wisdom, who is not at all sure he will find it. Here Reason offers a very apt metaphor to his royal pupil, and and this is an appropriate passage, of course, for a text sponsored by a king: the king in his court is implicitly, flatteringly, compared to the sun and to wisdom itself. His are (royal 'favour', but in a broad and positive sense) extends like the rays of the sun, throughout his household and his estate from private chamber to jail-cell and beyond. 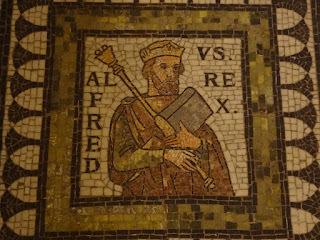 It's worth remembering that the maintenance of good roads was the kind of task a responsible medieval king might take an interest in - as Alfred himself did - and so perhaps all the many roads which lead to his court are also under his jurisdiction, under his are, as much as the people travelling on them. The king's roads are the king's responsibility, and they all lead to the same place. covered with frost, the buildings snow-swept. buried in an earthy grave. A list of all the ways people can die - this is the kind of thing which leads to wisdom literature being frequently cited as one of the aspects of medieval culture which modern audiences find especially challenging, or, worse, especially dull! I've heard this said many times, but I'm not sure it's actually true, and it was partly to test this assumption that I began my little Twitter experiment. The internet has fostered a boom in new kinds of wisdom literature, in the form of 'inspirational quotes'. These sayings walk a fine line between the profound and the banal, and as so often happened with medieval wisdom, they are often spuriously attributed to a famous name who can lend the words a bit of cachet (apparently this phenomenon has a name: 'Churchillian Drift'). It's easy to make fun of this, but it does make me wonder about the relationship between medieval wisdom and modern self-help. Most of the hundreds of people who've started following 'Old English Wisdom' in the past three weeks are not academics or medievalists, nor even people with a literary or academic background. What is it they find so attractive about Anglo-Saxon wisdom poetry? What is the appeal of the obvious statement, the truism, when expressed in language which is both familiar and strange (whether that's because it's in Old English, or because it follows the language and rules of poetry)? In some ways the answer is obvious. Wisdom of this sort is not theoretical, but eminently practical wisdom: it is meant to console you and guide you through life. The preface to the Old English translation of Boethius' Consolation of Philosophy (called in Old English froferboc, 'book of comfort') claims that Alfred translated it amid 'the various and manifold concerns with which he was often busied, both in mind and body'. Boethius' work was immensely popular in the Middle Ages, and it's not hard to understand the appeal of that kind of wisdom in unsettled times to a busy and anxious mind. Of course Boethius is much more profound than Twitter's plethora of 'inspirational quotes', but it's a continuum. People seek those, too, because they want or need inspiration, encouragement, guidance, support; however banal these popular sayings may seem, they represent a kind of search for wisdom. There are many roads to wisdom, and some of them go by very circuitous routes; but þeah cumað æalle to anum hlaforde.